How one Columbia Mailman student immersed herself in the debate over vaccinations on social media. I try to avoid conflict where I can. I rarely read comments left on news articles, and I’m even more averse to reading comments left on Facebook. So, what am I doing in anti-vaccination groups all over Facebook? Give any of these groups’ posts a quick skim and you’ll probably find yourself drafting novel-length rebuttals to any of them. Right. And these are just the headlines. I’ve also seen a post from a scared mother worried her daughter was showing signs of autism after being given the Vitamin K shot at birth; one from a woman wondering if her unvaccinated daughter would be allowed to visit her grandfather who was in the hospital; a post from a man who was about to start dialysis and was wary about getting the hepatitis B vaccination after his doctors told him he should. I was tempted to call these people out for their dangerous misinformation. Not only are they potentially harming themselves, but they are harming their children, and possibly the children of others. Just look at the increased rate of measles in the United States in the last couple years—we went from nearly eradicating measles to over 1,700 cases reported since 20101. In Europe, it’s even worse with over 41,000 cases in the first 6 months of 20182. I joined my first anti-vax group over the summer, as I happened to be right in the middle of reading House on Fire by William Foege, a book about smallpox eradication. I don’t remember why I joined in the first place—maybe just sick curiosity. But shortly after I joined, I saw the following post: “How can they say smallpox is ‘eradicated’ when they still vaccinate soldiers for it?” Aha! I knew I could answer this one. I explained that while smallpox no longer occurs naturally anywhere in the world, it is kept in government laboratories in the U.S. and Russia. The military is vaccinated in case smallpox is used as a bioterrorism agent. The woman thanked me for the information, and I felt great. Minutes later, I found that I’d been blocked from the group. Clearly, the moderators had felt threatened. So I started thinking: if not facts, what could I offer them that may help change their minds? I came to realize that I would never reach the trolls and the people who profit by selling anti-vaxx books and homeopathic remedies. I needed to focus on the fence-sitters, the mostly quiet majority who truly do not know what to believe. Blame it on holes in their education or poor science literacy, but equally blame it on the lack of transparency in the medical and pharmaceutical fields, a history of feeling slighted by the government, or just plain fear that comes when you become a new parent and have to see your child stabbed with a needle. I tried connecting with this group by arming them with the facts, sharing links to the CDC. Over and over, I got booted. Then I tried a new approach: asking questions to get them thinking instead of reciting facts. People don’t like to be told they’re wrong; they prefer coming to draw conclusions on their own. Once I asked how they felt about the rabies vaccine. Sure, it’s a vaccine, but it’s also used to solve a problem once the threat of rabies has already been made apparent. I wanted them to acknowledge that some vaccines are useful. Many got sidetracked and thought I was talking about vaccinating a rabid dog, but some of them were receptive to talking with me. My hope is that some of the thousands of quiet forum members read the exchange and realized, on their own, that maybe vaccines aren’t so bad. On another occasion, I had a private message conversation with a member of an anti-vaxx group. I asked her what she perceives are the chances of a person developing debilitating symptoms or death due to vaccination versus the chances of developing debilitating symptoms or death due to disease. She threw some false statistics at me, and with some quick math, I explained to her that, even if we used her numbers, what she’d just told me is that she’d rather face a .0127/100,000 chance of death due to measles vaccination than 220/100,000 chance of death due to the measles. She quickly changed the subject and soon our conversation ended. I don’t blame her. I had challenged her world view, and that’s a painful thing to face. But I’d also like to think I made her revisit her previously-held assumptions. We have to remember: we’re never going to reach everyone who distrusts vaccines. Many of the most vehement anti-vaxxers deliberately post lies in order to push those who sit on the fence into dangerous territory. We may never know their true motivations. But it’s the fence-sitters we care about. Over time and through patient conversation, maybe we can steer their beliefs in a new direction. 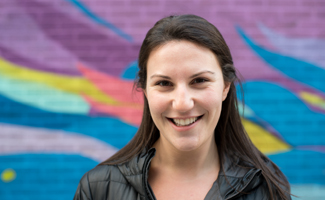 Rachel Alter graduated from the Accelerated MPH program at Columbia Public Health in December 2018. Her primary interests include infectious disease, pandemic control, disease eradication, and vaccination communication. She received her BA in neuroscience with a minor in writing from Colgate University in 2013. Rachel's work on dispeling myths around vaccines has also appeared on The Hill, New York Daily News, and The Guardian.